Why it matters: It's becoming common knowledge that exposure to blue light can suppress the production of melatonin, preventing your body from winding down properly before bed and making it more difficult to sleep, especially for those who remain on their devices throughout the evening. If you often work at night or simply like to read on a screen before going to sleep, this can be a game changer. In recent years many software providers have helped to address this concern, helping with eye strain and sleep patterns. F.lux is perhaps the most noteworthy of the bunch, as their application single-handedly brought the topic to the table among techies who have slowly but surely started adopting it years ago. Major operating systems have also begun building in an option for filtering out blue light, including Windows 10 (with the Fall Creators Update), macOS, Apple iOS, Android, and Amazon's Fire tablets. Even though the initial impression of the yellow hue effect might shock you, your eyes will ease into the change. Once the colors settle in, you won't want to go back to the regular colors during the night as they difference in eye strain will be significant. We'll provide brief walkthroughs for some of those operating systems, but F.lux has been around for about a decade now and is available on every major platform (download here). 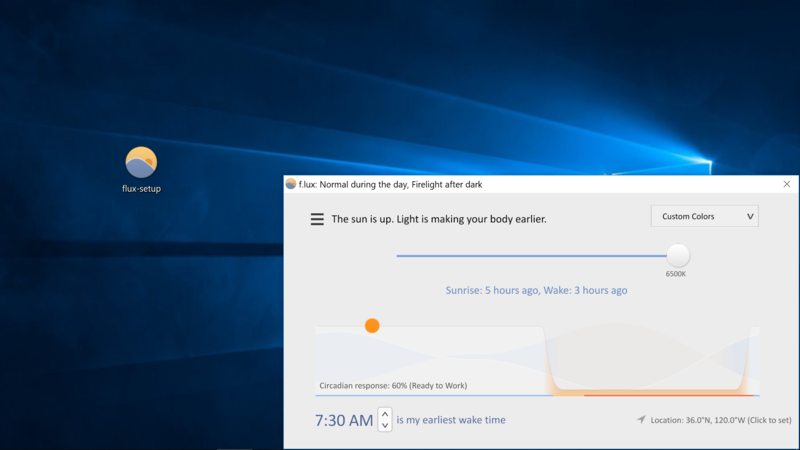 The software uses your location to match the sun cycle in your area, gradually adjusting your display color from 6500K (daylight) to warmer colors with less blue light as nighttime approaches. You can also manually change the temperature of your display between eight different colors, 6500K (daylight) being the brightest (blue/white) and 1200K (described as "ember") being the dimmest (orange/yellow). This can be reduced further by using the "Himalayan Salt Lamp" setting found under "Effects and extra colors." Other effects include "Darkroom mode" which makes your background black and text/interface red, "Emerald City" which applies a green tint, and "Soft White" which makes the daylight hue less fatiguing in our opinion, and it can be used in conjunction with the "Reduce Eyestrain" profile option. Folks with the Windows 10 Creators Update can enable the "Night light" feature found in Settings > System > Display, which will automatically apply a similar filter to your display as the sun sets and then remove it at the sun rises. 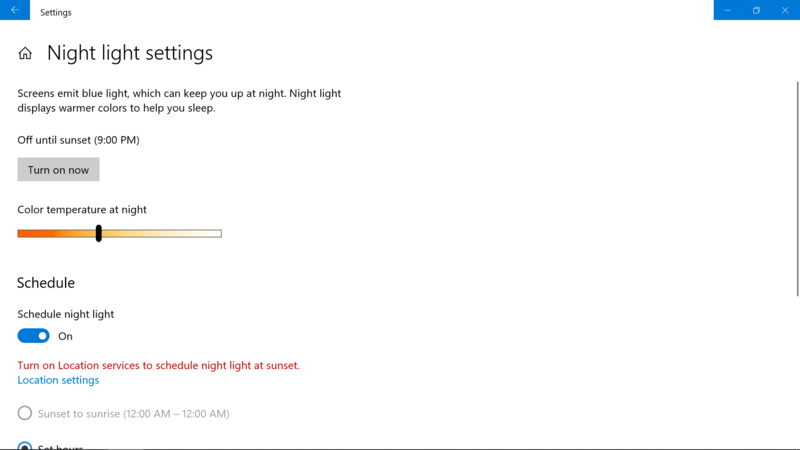 Along with the ability to set custom hours, you can tweak the temperature of the filter with a manual slider in "Night light settings" and the feature can be enabled/disabled without returning to the settings by using the button in the Action Center (beside the Windows clock). MacOS users from Sierra 10.12.4 onward have an option called "Night Shift" which can be found by navigating to System Preferences > Displays > Night Shift (tab) and provides about the same level of functionality as already described for Windows 10. Android N (or better) provide a "Night Light" feature. The actual name might vary depending on your phone's manufacturer but you should be able to make it out. Head to the Notifications menu > Gear icon > Display > Night Light. Amazon Fire tablet owners... head to Notifications menu > Settings > Display > Blue Shade.